It’s a very common discussion at marinas, online forums and in the comment boxes here at BigLiveBait.com. “How much flow do I need for my tuna tubes?”. You will hear answers like “you can never have too much” or “1/2hp per tube” or “reduce your plumbing to get more pressure”, or “increase your plumbing to get more flow”. Honestly until someone qualified does a full audit of your system these answers are just shots in the dark at a dartboard that they’ve never seen before. When tuna swim through the water, they cruise at about 10-12knts. The water they cruise through is bubble free and pretty much non-turbulent. Now we are not talking about when they are busting on schools of baitfish or skying. We are talking about just a normal life sustaining cruise speed through the water. But when you examine tuna tube installations and stick your hand down into the tubes to actually feel the flow, you will rarely find a uniform, non-turbulent flow. You will be shocked to find some flows off-center as much as 20deg. Some flows flutter around the inside of the tube, some hug the edges with little/no flow in the center. Some are basically a pressure washer stream in the center that blasts the fish in the face. Below are a couple of videos slowed way down so you can visualize what the flow looks like. This flow will never keep bait alive, lots of eddys as the water flow is exiting on the edges of the plumbing fitting. If you look carefully the center of the flow is actually reverse flow at times b/c of the eddies, basically sucking water out of the fishes mouth while water passes beside the fish. This flow is too concentrated in the middle, flow should be distributed more widely across the fishes mouth. This is akin to blasting the fish in the mouth with a pressure washer. If this bait’s mouth/head get off-center in the least bit, the flow will actually keep their head pushed off of the flow and the will quickly expire. So, what should good flow look like? It should be laminar (straight), non-turbulent and spread across the entire fishes mouth/face. The tuna opens their mouth when they want to breathe, flow should not blast them in the face at 30mph. This graphic visually displays the difference between laminar non-turbulent flow (top) vs. turbulent flow (bottom). In the world of tuna tubes we are shooting for the second from top. And we want the flow in the 8-14knt range. So, the question then becomes, how do I straighten and diffuse my flow so that there is an even flow across the bait’s head and mouth? 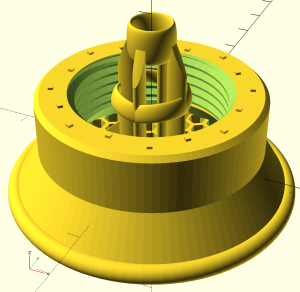 The answer lies in flow straightening and normalizing nozzles. The flow is gathered to the center then dispersed over the face of the bait. Each Bait Sock comes standard with these nozzles and is a large part of the success of Bait Socks in keeping bait alive for extended periods. Flow hits the primary foil first which centers the flow, then the secondary foil disperses it over a wider area. 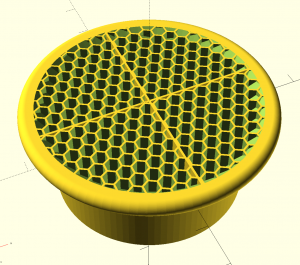 The honeycomb section serves to straighten and normalize the flow. In the two videos below you will see the same pump (approx 1100gph) with and without a flow straightening nozzle. This video shows a pump without a flow straightening nozzle attached. The flow is very erratic and extremely turbulent. The flow wanders back and forth. The flow has extreme hot spots (pressure washing the bait) and completely dead zones and several reverse eddies when placed in the water. Unfortunately this is what the flow looks like in most tuna tube installations. This video shows the same pump with a flow straightening nozzle attached. It’s easy to see (and hear) the difference in the flow. This flow is much straighter and more laminar, turbulence is all but eliminated. Once you have a smooth laminar flow, we can now discuss flow volume. Flow volume is absolutely critical to bait survival. But you have to be careful to ensure the bait’s head stays within the flow. Some tuna tubes have cone ends, some have silicone inserts, others (like Bait Socks) actually hold the bait’s head in place ensuring a proper flow volume reaches the bait’s mouth. Remember: Flow quality and what flow actually passes over the bait’s gills is the important factor here. You can have all the flow in he world, if it’s not making it to the bait’s mouth you have dead bait.